This breed was founded in the state of Delaware from an original Barred Rock and New Hampshire cross. The Delaware is considered a heavy breed which lays a nice brown egg. The feathering on these beautiful birds is almost all white but shows a slight indication of barring in the hackle and tail. Delaware are a nice quiet bird when well tended to. This picture is of a 2 week old. When shipped, these chicks will be between 28 and 63 days old. At 28 days old, most chicks do not require supplemental heat, and so can be started out in your coop. TThey are vaccinated for Mareks and Coccidiosis. They have been watered with Quik Chik and given Gro Gel. They are raised on an all natural GMO-free feed. Because they do not require supplemental heat, we are able to ship as few as 1 of these 4-9 week old chicks. 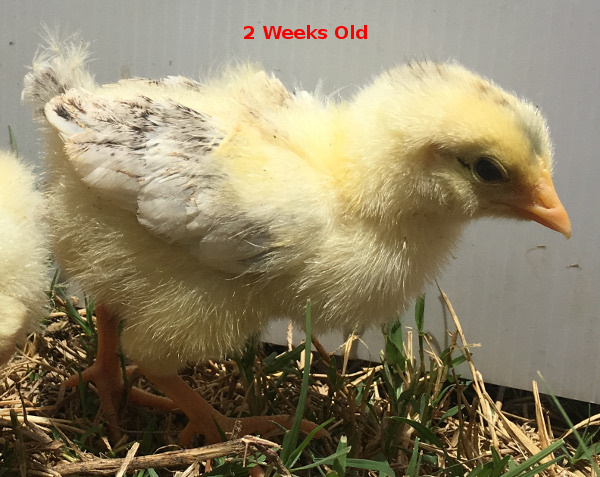 You can mix and match any type of 4 week old chicks in your order.